Years ago I was privileged to visit a community garden full of senior citizens that loved to garden. Most of them were women of the old Southern tradition. Their leader, Mrs. Banks, was dedicated to the garden and called me “honey” when I visited. It was a special place. Thank you Fred Conrad for introducing me to it. The garden had the support of their larger community and that allowed them to grow needed food for their tables. This garden facilitated neighbors visiting with neighbors and sharing meals. Very good stuff. One year the entire group was growing collard greens to share on Thanksgiving. As all Southern gardeners know, collard greens are only good after a frost. We had an early frost that year so the crop seemed promising. The gardeners woke up on Thanksgiving morning to find that their collards had been ripped from the garden, stomped on and destroyed. There Thanksgiving feast was ruined. What had happened? The group discovered that a young man, visiting his grandmother for the holiday, had done the damage. The group had a choice. They could notify the police. The young man could be charged with a crime that could follow him as he became an adult. The group decided they would handle it on their own. They had the vandal clean the garden and they put him on garden chore duty for quite a while. Thinking about it facing the police may have been easier than facing an angry Mrs. Banks! I have thought about that young man. What kind of person is he as an adult? I suspect that his encounter with this group of Southern gardeners had a positive effect on him. By handling the problem themselves they showed him some very tough love. I think he was the better for it. On this Thanksgiving I am thankful for the ladies of this garden, thankful for gardens like this everywhere, and thankful that community gardens are only partly about the food but more about the community. Over the next few weeks we are going to explore “tiny topics” in the garden. These will be garden topics that are more in-depth than a horticultural overview. My goal is to have us all thinking about gardening in a more deliberate way. Our first topic is microclimates. What are they? How can they make a difference in your garden? Most gardeners are familiar with the USDA plant hardiness zones. These are based on average annual extreme minimum temperatures. For example if your average annual extreme minimum temperature is 10 – 15 degrees F your plant hardiness zone is 8a. These zones are based on past climatological data. Suggested planting dates and many plant recommendations are based on these zone assignments. But what if your garden is located close to the south side of your home? At this location the temperatures don’t get quite as cold as if the garden was located in the middle of an open field. This is a microclimate. By planting mint right next to the south wall of my home in an area also protected by a porch wall I am taking advantage of a microclimate that allows me to have fresh mint most of the winter. On the other hand a garden located on a rooftop in Atlanta is brutally hot in the summer. The full sun in an area where building materials create radiant heat and reflected sun light means that cactus are happy there. Another microclimate. This microclimate in Atlanta means a cactus garden. What if your garden is in a bit of a valley in your landscape? You may notice fog settles there or dew seems to last longer in the mornings. In this microclimate you need to look out for fungal diseases that occur with cool moisture. Downy mildew may be a problem for you. I recently visited a community garden in the North Georgia mountains. Even after officially reported night time temperatures of 32 degrees F the gardeners were still harvesting peppers. The group took advantage of a microclimate next to a shed that prolonged the growing season. Using plastic to artificially warm up the soil in the early spring creates a microclimate that allows seeds to germinate early. I have used this technique in the past to plant squash early in an attempt to outwit squash pests. I hope these examples have you thinking about the microclimates in your own garden. They may allow you to grow crop varieties that you would never have tried before or you may extend your growing season. Over the past several weeks I have been contacted by several community gardeners who have discovered saddleback caterpillars by feeling their painful sting. I was stung by one years ago while harvesting okra. It literally knocked me to the ground. To avoid more gardening mishaps with these creatures I want to share this article written by Randy Drinkard. Stay safe out there gardeners! Most people know that bees, wasps, hornets and some ants can sting to defend themselves or their nests. Only a few people realize, usually from first hand experience, that handling some caterpillars can produce some painful results. Recognizing the few stinging caterpillar species, including the saddleback, may prevent irritating encounters. 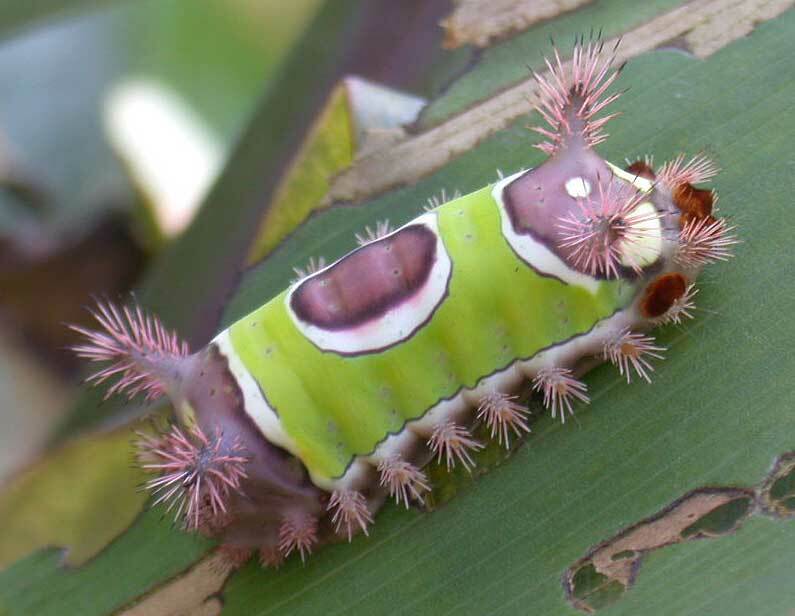 The saddleback caterpillar measures about an inch long, and has poisonous spines on four large projections (tubercles) and many smaller ones projecting from the sides of its body. The “saddle” consists of an oval purplish-brown spot in the middle of a green patch on the back. The saddleback caterpillar is a general feeder and is generally found on many hosts including corn foliage, apple, pear, cherry, rose, Pawpaw, basswood, chestnut, oak, plum and other trees in late summer. Diagnosis is usually simple since a rash generally breaks out where the hairs or spines have made skin contact. Contacting the hollow poisonous hairs or spines (connected to underlying poison glands) causes a burning sensation and inflammation that can be as painful as a bee sting. The irritation can last for a day or two and may be accompanied by nausea during the first few hours. Usually the site of contact reddens and swells much like a bee sting. Immediate application and repeated stripping with adhesive or transparent tape over the sting site may be helpful in removing broken hairs or spines. Washing the affected skin area thoroughly with soap and water may help remove irritating venom. Prompt application of an ice pack and a baking soda poultice should help reduce pain and swelling. Household analgesics, such as aspirin, appear to be ineffective for reducing pain and headache. However, oral administration of antihistamines may help relieve itching and burning. Topical corticosteriods may reduce the intensity of inflammatory reaction. Desoximetasone gel applied twice daily to affected areas may also help. Prompt referral to and treatment by a physician should be made when severe reactions are evident. Very young, aged or unhealthy persons are more likely to suffer severe reaction symptoms. Occasionally, these stinging hair caterpillars may drop out of trees onto people, crawl into clothing on the ground, occur on outdoor furniture or sting when brushed against on plant foliage. Be careful when attempting to brush them off. Never swat or crush by hand. Remove them carefully and slowly with a stick or other object. Individuals, especially children, should be cautioned about handling or playing with any colorful, hairy-like, fuzzy caterpillars since it is sometimes difficult to distinguish between harmless and venomous insect larvae. Never handpick these hairy, fuzzy or spiny caterpillars except with heavy leather gloves if necessary. Wear long sleeve shirts, trousers and gloves when harvesting sweet corn or working in the landscape in late-summer and early-autumn to reduce possible stings. Usually, these stinging hair caterpillars do not occur in sufficient numbers to warrant the use of pesticide sprays. Should potential hazards exist around residences or schools, infested shrubs and trees may be sprayed to reduce or eliminate these caterpillars. Sprays of carbaryl (Sevin), or Bacillus thuringiensis (Biotrol WP, Sok-bt, or Thuricide) as well as various pyrethroids (bifenthrin, cyfluthrin, cypermethrin, deltamethrin, lambda-cyhalothin, permethrin and tralomethrin) in formulations labeled for bushes, shrubs and trees, can be helpful, if practical. Be sure to read the label, follow directions and safety precautions. All of Georgia has seen a large amount of rain this summer. Rain is great for our crops and also great for weeds and if you have gotten lazy with the summer heat your plots may have more weeds than crop. You are not alone! This may be a great time to review best management practices for weed control. Rule #1: Get the roots out. If you just remove the leaves above ground chances are the weeds will come back and you will need to perform the same weeding chore over again. Many perennial weeds grow from underground roots and tubers. Those need to be removed as well. Rule #2: Remove the weeds before they make seeds. If your weeds are allowed to flower and make seeds your work will get much harder. Weed plants can make an incredible amount of seeds. For example, common chickweed can produce 800 seeds per plant. Dandelion flowers can make 40-100 seeds. Crabgrass can produce 53,000 seeds per plant and pigweed can produce over 200,000 seeds per plant. Don’t let those weeds flower! Rule #3: Don’t let weeding get out of hand. 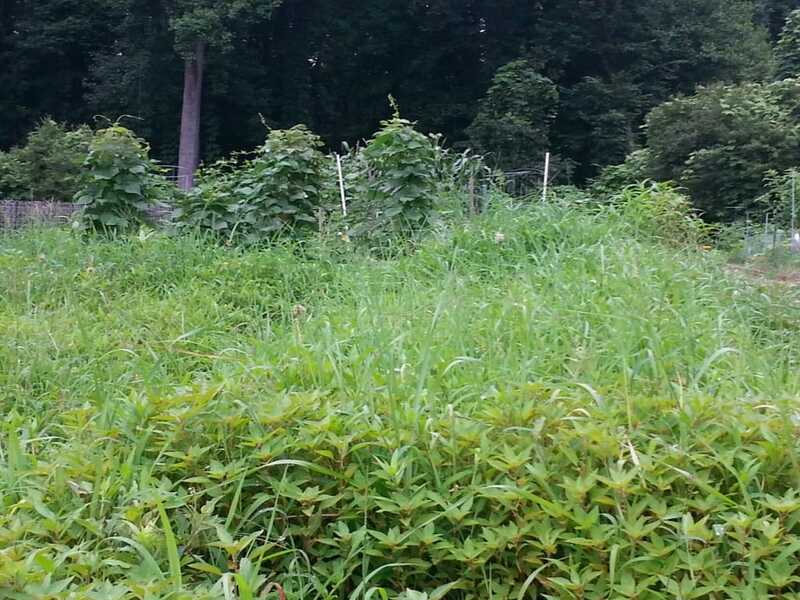 If you don’t routinely remove weeds you could be looking at a plot of weeds that seems overwhelming to tend. Your vegetable production will suffer as the weeds take up the water, nutrients, and space that should be used for your plants. And, it will take a lot of initiative to start the long process of taking back that space from the weeds. 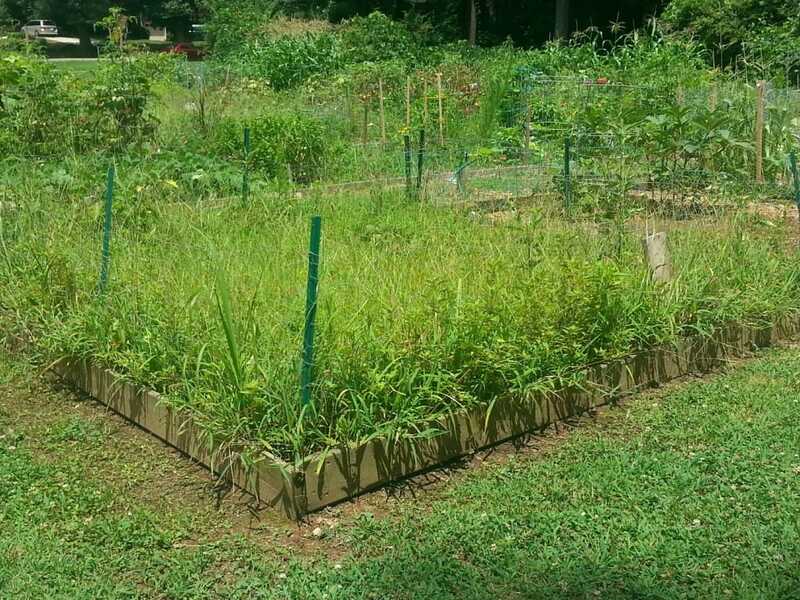 Don’t let weeds take over your community or school garden plot. Knowing what weeds you have could be helpful in coming up with a long-term weed management plan. 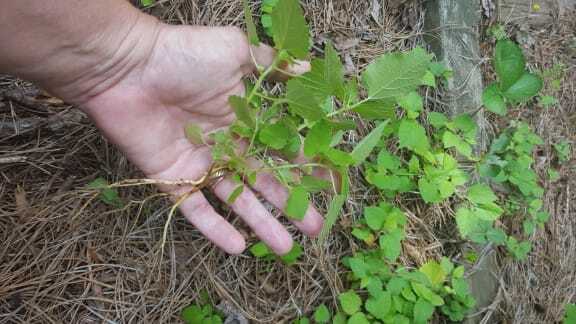 Your local UGA Extension agent can help with weed plant identification and help you find strategies to minimize weed issues. If you are kickin’ it with kale this fall you will want to grow a large and delicious crop that your students will enjoy eating. Luckily, kale is easy to grow in Georgia during the fall! Growing cool-season crops in Georgia means less disease and pest pressure. You may be interested to know that the flavor of your kale can change depending on your soil chemistry. According to Tim Cooling, UGA vegetable specialist, many of the bitter compounds we associate with kale are due to the amount and availability of sulfur in your soil. This could be the start of a great school science project! Sprinkle a small amount of soil on top of the seed bed and tamp down. Tamping ensures good seed-to-soil contact and is an important part of planting small seeds. Cover the plot with a layer of mulch. This time of year mulch is imperative to keep temperatures and soil moisture even. Avoid heavy mulch like wood nuggets. The small seedling cannot push those nuggets out of the way when they emerge from the soil. Water well and keep the plot moist as the seeds germinate. With late summer heat you will definitely need to water your seed beds. Keep an eye out for weeds as they can sneak into your monocrop of kale. Learn what a kale seedling looks like so you can remove everything else that comes up in your plot. Your crop may need thinning. If so, you can eat the thinnings! A delicious kale meal starts with healthy kale plants! Keep an eye out for pests and start planning those kale recipes. Contact your local UGA Extension agent if you have any questions or problems.